His longtime partner, and dear friend of mine, had just passed away, in Paris, sort of unexpectedly. She’d been diagnosed with cancer 18 months earlier and had been living in India, with her daughter and mother, treating herself with ayurvedic medicine. But in the end it wasn’t the cancer that got her. On the plane, en route to a week’s vacation with Ian, she got a blood clot in her leg, which traveled to her brain. She died in the hospital, in a coma, peacefully, with Ian holding her hand. I hung up, feeling sorry for myself that I couldn’t be there. I thought back to the eighties and early nineties when we, a group of young (well, young at the time) women living in Paris called ourselves the La Bande des Cinq. The Gang of Five. A group made up of me, an expat American; Martine, a French woman; an Australian named Sue; Lisa, who grew up all over the world but was most recently Irish; and the one who had just passed, an exotic, passionate Indian woman, improbably named Sputnik. (She was born on October 4, 1957. Family lore has it that her uncle walked into the room and declared “Our own baby Sputnik” and that was it, that became her name.) I started searching flights, unconvinced that I’d find something affordable, but determined nevertheless to give it a try. After a bit of searching I found a flight that was outrageously expensive, but what the hell? When else would I see all of these people, all of her friends, her family, in one place, together, again? How could I not be there? I booked the flight. I arrived on Sunday morning, Bastille Day. Traffic near the parade was somewhat interrupted (I’d planned breakfast with my friend Betty, who lives near the Champs Elyséees) but otherwise, it was a fine, festive day to be in Paris. I met Martine for lunch at 12 at Bofinger, the large, famous brasserie just off the Place de la Bastille. We ordered a bottle of champagne, Sputnik’s favorite drink. “Do you remember the last time we were all here, the Bande des Cinq?” Martine asked me as we took our seats. “It was just before Lisa left for Dublin, before her kids were born.” (Her oldest is now 21. You do the math.) “We met at noon,” Martine reminded me, “and one after another, we each paid for a bottle of champagne.” By 5:30, she said, and five bottles of Ruinart later, the management was so impressed that they offered a sixth bottle on the house. I didn’t remember – it may have been all that champagne! – but it seemed fitting to be there that day, drinking together. Martine and I ate well – sautéed foie gras and oysters and some cheese and salad for dessert. We cried a little, we laughed a little, but mostly we celebrated. We celebrated friendship, we celebrated the past, we celebrated the passage of time, and we celebrated the sadness of growing older, of which death – and loss – are increasingly a part. The cremation ceremony was at 4 p.m. the next day. 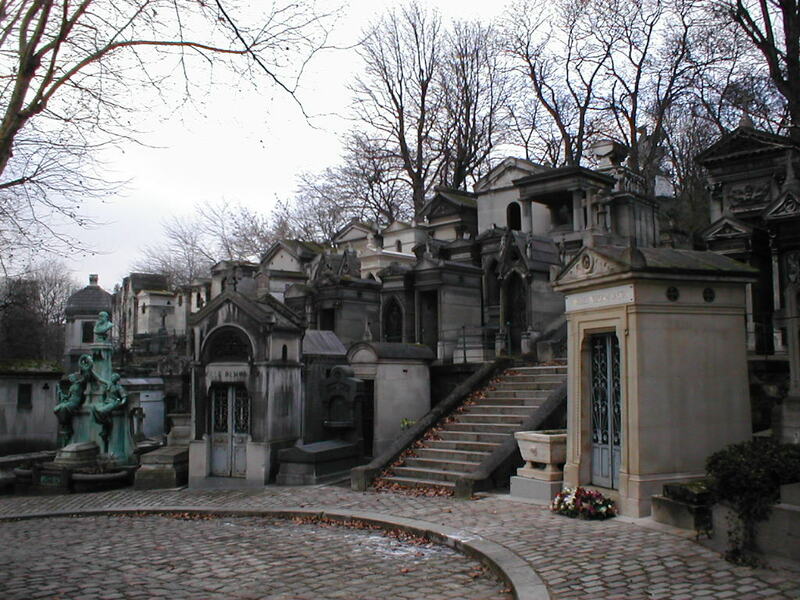 I’d arranged to meet my friend Beatrix, who was not attending the funeral, for lunch, at a small restaurant just outside the gates of Père Lachaise, on the Gambetta side. I got there a few minutes early and stood at the zinc bar of a nearby café, and ordered a coffee. Next to me, a man – who’d obviously been drinking something stronger than espresso – was showing the woman behind the bar a photograph. “And this is another one of my wife. Isn’t she lovely?” I had no idea whether he’d just buried his wife that morning, or if this was a recurring theme, if he was a regular. I looked at the barista and thought, I bet she gets that a lot. I met Beatrix at the restaurant next door, a cheery place with good hearty food, filled – I guessed – half with mourning families and half with tourists – the cemetery is, after all, a major tourist attraction – with a sprinkling of locals for whom this was just their neighborhood bistro. As I approached the crematorium, just after 3, I began to recognize a lot of familiar faces, people I hadn’t seen for years, decades even, including Sputnik’s daughter, who’d flown in from India, and Ian’s son, who’d been working in Haiti. I introduced myself to an English woman I didn’t know, who said she’d worked with Sputnik over the past few years, putting together independent radio programs, mostly in Africa. “You might say we were fellow travelers,” she said. I smiled and said what a fitting expression that was. She looked at me, puzzled. “You do know that the Russian word Sputnik means ‘fellow travelers’?” I asked her, amazed that she’d chosen those words randomly. breath – breathing human being. When it was over, Sue and Martine, and I made our way to the same restaurant where I’d had lunch, to digest the afternoon’s events and to say a last goodbye in the only way we knew. Sitting outside, in the sun, we ordered trois coupes de champagne. We talked about our old friend, her strong opinions – we used to call her La Pasionaria (as if she needed another, amusing nickname), her difficult but feisty personality, and her fierce sense of loyalty to friends. We admitted that Sputnik could be, at times, hard to take. Her recent Facebook postings – rants, for sure – often made me want to scream. I recounted the last time I’d seen her, when she visited Washington (where I am now living) about seven years ago. I felt guilty, because I didn’t feel like I’d been very inviting, very hospitable. For one thing, it annoyed me that she insisted on smoking in her non-smoking hotel room. “Well, they promised me a smoking room,” she’d said defiantly, as smoke blew out of her nose. We parted soon after, having turned our tears and sadness into laughter and hugs. We were still, and would always be, a gang of five. When it comes time for me to go, I hope that I am considerate enough to do it on a glorious summer’s day in a place at least half as beautiful as Paris. I urge Martine to have a generous helping of foie gras the day before my funeral, and I invite Sue to reveal all the things that have annoyed her about me over the years. I hope Lisa will turn up and remind everyone of the time I showed up at her house in Tobago and had to borrow a hundred bucks from her and her husband just to get home. I urge everyone to drink champagne, lots of it. Because it will be all about them. I’ll just be providing the excuse. A native New Yorker, Laurie Lesser went to Paris “for six months” after graduating college – and stayed more than 25 years. Back in the States, she now lives in Washington DC, where she works as a writer/editor for a government contractor on international development projects. She has traveled extensively throughout Europe, Africa, and the Caribbean. Laurie is finishing up her MA in Writing at Johns Hopkins University. She writes mostly non-fiction – personal essay, memoir – but is increasingly tempted to play around with the facts through fiction and screenwriting. Just the way it was… and so much more. I own Sputnik to be proud of what I think, of what I want, of how I feel. She gave me that taste of liberty and, as you say, the sense that faithfulness is not only a word. I always be there for you, for all of you. Thank you Laurie for this amazing and so touching text. And yes, the Bande des Cinq will never end ! Champagne !!!! Your friend pour toujours, Martine.